In order to support the need for group access to workflows (for example, a Department or Business unit), we created a “Team” function. “Teams” allow administrators and finance people to access information - all in one place - about a set of one or more workflows and in particular, the financial transaction information related to them. It’s at the Team level that bank account/ payout information is setup and managed. All workflow payments from one team will go into the same bank account. If your organization has payments that should be sent to different accounts, a different Team should be created for each bank account. If payments from a workflow should go to that account, they’ll need to be in that Team. 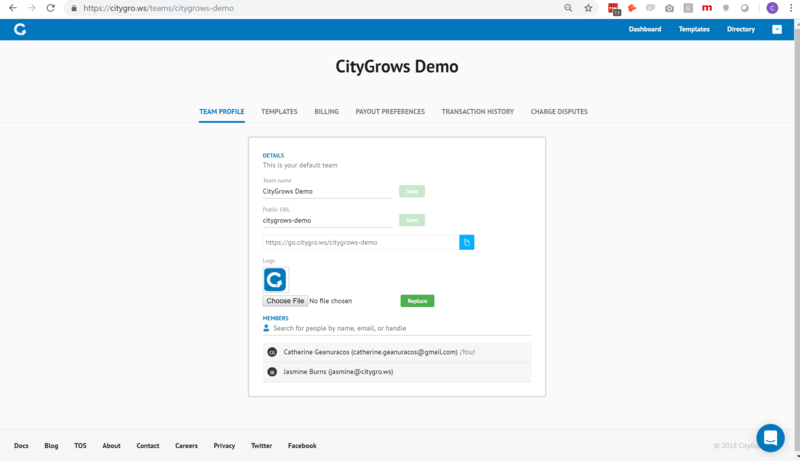 CityGrows sets a default description for the transfer from our payment processor to your bank account - it’s “CityGrows” + the beginning of the Team name related to that transfer. Unfortunately, banks only allow for 22 characters of description to be added to each funds transfer. You can access the Team section of CityGrows to view and edit your teams via the dropdown arrow at upper right of screen.